Founded in Paris, France at a historic caucus of 1,000 members of the Allied Expeditionary Force on March 15-17, 1919. 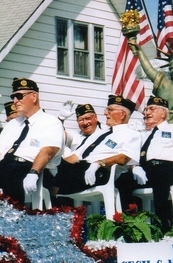 The American Legion was chartered by Congress on September 16, 1919. On October 29, 1942, and on December 28, 1950, Congress amended the charter to open American Legion Membership first to veterans of World War II and then to veterans of the emergency period which began with the Korean conflict on June 25, 1950. Since the Korean conflict, Congress has authorize the inclusion to veterans of the Vietnam War; February 28, 1961 to May 7, 1975. The Lebanon/ Grenada hostilities; August 24, 1982 to July 31, 1984. The Panama hostilities; December 20.1989 to January 31, 1990. The Persian Gulf hostilities; August 3, 1990 to the cessation of hostilities as determined by Congress. 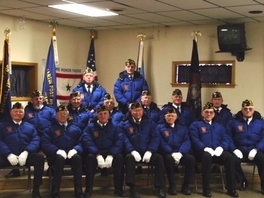 The organization of the American Legion was completed at the St. Louis MO. Caucus of May 8-9, 1919. At this meeting was composed the Preamble to the organization’s constitution, setting for the purposed and principles of the American Legion. In 1919, several veterans’ of World War I wanted to become a part of the National American Legion. 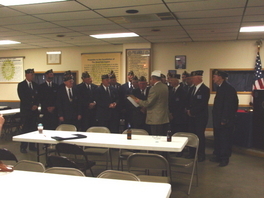 On September 5, 1920 the local post was presented its charter by the National Headquarters of the American legion through the State of Indiana American Legion. Post 250 was named after a young Mitchell boy by the name of Cecil C. Martin, who was only 22 at the time of his death. Martin was killed October 6, 1918, in Brest, France. At one time, Martin’s father Add Martin served as Mitchell’s Chief of Police. Martin’s body was later returned to the United States and was laid to rest in the Arlington National Cemetery. Cecil C, Martin was the second confirmed Mitchell death. Harry Niles was killed in France, September 12, 1918. Cecil C. Martin entered service in February of 1918 and was a member of Company L of the 58th Infantry, 4th Division. The first meeting place of Post 250 was above what most current members would call the old Polson Drug store, In 1922, the meeting place was moved to the upstairs in the Crawford building, That building was where the First National Bank parking lot which is now a public park just next to police station which was the old bank. In 1923, the Grand Army of the Republic (GAR) turned over all its equipment to Post 250. From that time to the present Post 250 has presented military burial honors, upon request, to all honorably discharged veterans. We had the old Springfield rifles until June of 2004 at that time the government traded them out for the M1 grands the honor guard uses today. The Post also has some m16’s that they use occasionally they were given to the Post by Gary Mesarosh. After the end of WWII, the membership in Post 250 jumped sharply and the members decided to buy a permanent home. In 1947, the post purchased the Ben Diefendorf home at 515 West Oak Street. The membership continued to grow and it was decided to add a meeting room and kitchen to the east side of the house. This addition was built in 1948-49. Most members will remember the old casket factory, later the workplace for Ralph Carpenter’s wagon and blacksmith shop that stood on the southwest corner of 6 and Brook Street. This building was torn down on January 20, 1949 and several members of the post removed many of its timbers and used them for rafters in the new addition. In 1957, the most major of all the posts construction projects took place. The original Diefendorf part of the post was torn down and the new stone building we now have replaced it. Other than minor projects the new home pretty much remained the same until 1967. At this time a new bar was built. In May 2007 the bar was again remodeled with the middle of the ceiling removed in the bar and a shelf all around for the display the late Gib Sheeks commemorative bottles from National Conventions he traveled too. June 2007 the Back Deck got a new roof. The walks out front were redone and a new flag pole and pavilion was made the old home was looking spiffy. 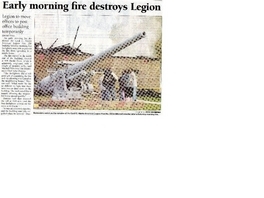 On the morning of November 3, 2007 at 4:00 AM the American Legion as we knew it burnt to the ground. All the old pictures and memorabilia were lost. Everything that everyone had worked so hard for was gone in a mater of hours. February 2008 the Board of Directors set out to get the Legion rebuilt, they hired an architect and plans were drawn up. February 2008 the McIntyre Brothers removed what was left of the Post and the Lot now awaits the awaking of the new post. 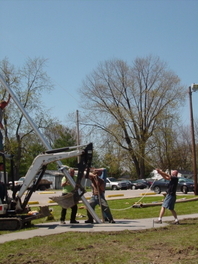 June 4, 2008 the ground was broke for the new and Improved American Legion Post 250. June 9, 2008 the McIntyre Brothers started on the foundation. The New Post will be finished within 4 months, and then we will have a new and improved and bigger American Legion. The Cecil C. Martin has a reputation for being the friendliest Post in Indiana and now will be the best. As of December 2008 we now have a new building. Awaiting the keys to the building we will hold new year’s eve party and the kids Christmas in the new building. The Cecil C. Martin Post 250 has now and in the past served more than 250 kids with candy at Christmas with Santa and for the past 6 years had a pizza party on that day with a picture with Santa. Thanksgiving and Christmas food baskets in 2007 were for 40 families each holiday, we did 72 kids for Cloth-a-Child in 2007 and 38 kids in 2008 the year we were burnt. Each child received $100.00 for clothes and $25.00 for a toy or special for them that Santa gives them at a special party just for them. We were burnt to the ground and still kept the donations and projects of the American Legion going. We have never let the Veterans, Community or the children down. We opened for business on January 24 2009 and On March 3rd, 2009 we had the grand opening to the New and improved American Legion Cecil C Martin Post 250, Mitchell. It stands on the site of the old post home. Bigger and better everyone is glad to be able to come home. Among the members we had The Commander of the State of Indiana, The Auxiliary president of Indiana and the Adjutant and several others from the state and district here for the opening. 2010 opens with a bang. Our Independence Day leads us to better economy and our boys coming home from Iraq. The post is doing well since the fire in 2007. In 2010 The Post helped 52 families with food baskets and did Cloth-a-child for 73 Kids. 2010 Rings in and the Post is still improving. The Son’s of the Legion donated their time and built a Roof over the deck out back. They also installed some speakers for music. 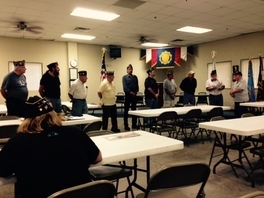 Since 2002 The Legion has been taking veterans to the VA in Indianapolis. We have a Chevy Venture van. This Van runs on donations only and helps those who don’t have a ride. The Community meets in our Meeting room once a month to pick up food commodities from the Hoosier Hills food bank. August 22nd we were visited by John Hickey Department Service officer and the public was invited to come and join the meeting about VA benefits. 2012 is now here and we had our First Annual Evie Hill Super Bowl Party for a cure. This included an Auction to raise money for Breast Cancer and Cloth-a-Child in Evie’s name. We raised $1164.00 for Breast Cancer and $567 for Cloth-a-Child. First time ever our Americanism and Government kids and Flag Etiquette kids from Mitchell took the 9th District also. We are very proud of our youth. July 1 2011 now the Lounge is the only place you can smoke in the Legion. It was taken to a vote of the Legionares and they voted to leave the Lounge smoking and everyplace else non smoking to comply with the governors order for smoking ban. We put up new swinging doors to the kitchen to comply with this order. 2012 The National Commander came to visit the Post..National Commander Jim Koutz is an Indiana boy and we are so proud of him. We are so honored that he chose our post as one of the few to stop at in Inaiana.. December of 2012 We did 25 Food Baskets for Christmas and Did Cloth-a-Child for 42 Children out of the Mitchell Community. 2013 is a New Year and Legion is gearing up for a better one. The 2nd Annual Evie Hill Super Bowl auction and party was held again this year. We had a lot more prizes this year but participation was down. We ended up with 560.00 for Breast Cancer research. That was down half but all who came had a great time and that is what it is all about and the memory of our Dear Evie. Summer has come and gone all has not changed at the post but are gearing up for the Thanksgiving and Christmas projects. Winter has come and we have done 30 Thanksgiving and Christmas baskets and Cloth around 38 kids. 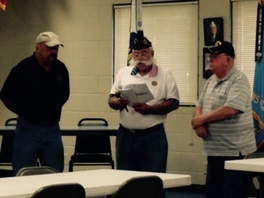 2014 has rung in and the American Legion is still going. We have implemented a few specials in the Lounge so that people can afford to come out and enjoy the companionship. The 3rd Annual Evie Hill Super Bowl party and auction for a cure was a huge Success due to Rich Ward and Debbie Ward working so hard. We raised 2000.00 for Breast Cancer Research and 1000.00 for the Cloth-a-child project. We would like to thank all who participated. Memorial Day Flags were placed on the graves of our Veterans and the Post provided Breakfast for the volunteers. May we had our First FAMILY FUN DAY where all of the kids are welcome to come and enjoy bouncy Houses play games and face painting and many more activities. We donated 20 Thanks giving and Christmas baskets and clothed 37 children this past Christmas. 2015 is a promising year. We started off with money in the bank and keeping the Legion up and running smoothly. May we had our second FAMILY FUN DAY where all of the kids are welcome to come and enjoy bouncy Houses play games and face painting and many more activities. June is the installation of a new commander and officers who took office July 1, 2015. This Summer is the time for some maintenance to the building, The back deck fence has been painted inside and out and is looking good. The Auxiliary has installed fans and new chairs on the deck for your pleasure. 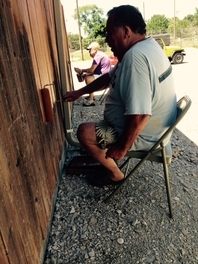 The Horse shoe pits have been redone and are able to enjoy adult beverages out there in our picnic area and have new picnic tables there. We did 32 food baskets for Christmas and thanksgiving and did 48 kids for Cloth-a-child. July 2015 to June 2016 Gary Mesarosh is Commander of Post 250. He has spent many hours at the Post and has been able to reduce the mortgage considerably, in the short time he has been in office along with other officers and the Auxiliary, SAL and Riders. January and February 2016 have been good. We had our Appreciation dinner for all our Volunteers and our 50 year plus members and March brings the American Legion Birthday dinner. The 97th Birthday dinner was a huge success. Although not like it was when Gib Sheeks NEC was alive but good never the less. Speaker was Jerry Jordon NEC. This year we are sending three Boys to Boys State. May 2016 and the Legion is looking forward to FAMILY FUN DAY. It rained and was cloudy most of day but all of the kids and parents that came out had fun. We had free hot dogs chips and soda for all. The only thing the kids paid for was the dunk tank. Face painting and two obstacle courses also there for all. They had horse shoe pitchers and corn hole and a bike show. May 28 was the flag placement volunteers breakfast. This year I would like to Thank the Boy Scout Troop 348 for helping make that day easy. These boys were out in force at Cresthaven to help place over 1000 flags. As long as everyone pulls together we can do anything. This History is dedicated to Charlie “PeeWee” Jones who was the Cecil C. Martin Post 250 historian for many years and collected most of this history.